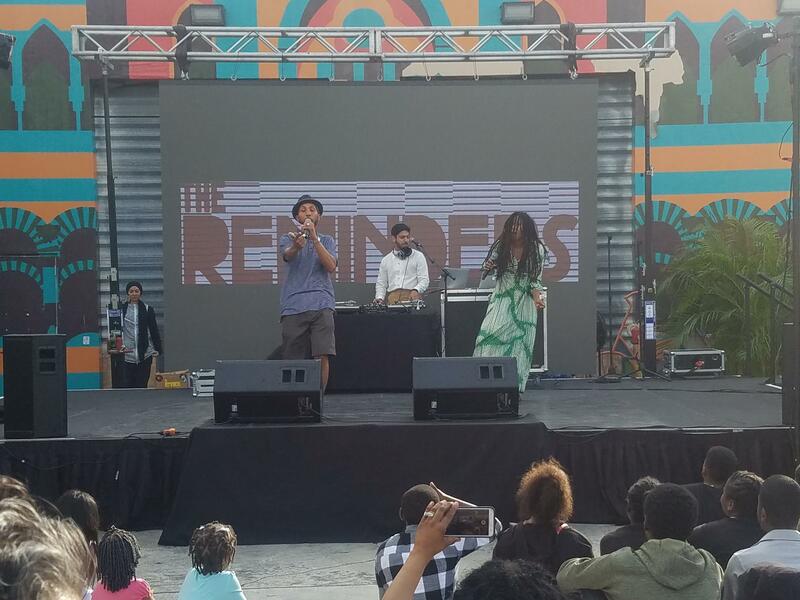 Hip-hop, Islamic culture and the community of Opa-locka intersected on Saturday during a block party held at the Opa-locka Arts and Recreation Center. The event, Hip Hoppa Locka, was a culmination of a two-week residency program by Miami Dade College's Live Arts in which Muslim artists taught students from the Arts Academy of Excellence Charter School hip-hop-inspired styles of art, dance and music. MDC Live Arts has brought performers from around the world to perform in Miami-Dade County since 1990. Director Kathryn Garcia said the organization wanted to expose the community to Islamic culture in an attempt to curb negative stereotypes associated with Muslims. "This season we are focusing on the Muslim world. Hip Hoppa Locka is a part of that. We are really exploring what keeps people together instead of what keeps us apart, " said Garcia. "Everyone has come out to enjoy and celebrate the unifying force of hip-hop which is so incredibly important in so many parts of the world, not excluding the Muslim world." Big Samir (left) and Aja Black form the hip-hop group 'The Reminders.' They performed at the Opa-locka Arts Recreation Center (ARC) on Saturday, April 21. Among the resident artists invited to teach the students was hip-hop dancer Amirah Sackett, singer and emcee Aja Black of the group The Reminders and graffiti artist Cita Sadeli known internationally as "Chelove." The artists spent a few hours each morning teaching the children about their crafts. Chelove said the children "slowly warmed up to the feeling of what we were doing in art. A bunch of them really excelled. The staff was surprised because some of the kids really didn't show a lot of interest in art before this. It was cool for them [the staff] to see them open up like that. " The artwork created by the students during the residency was on display in the ARC as well as signs they created to carry during last week's nationwide walkout for the 19th anniversary of the shooting at Columbine High School in Colorado in which 13 people died. The students also performed hip-hop choreography and sang on stage for dozens of spectators. Marcus Themistocle, 12, struggled to choose which class he enjoyed the most during the last two weeks. "My favorite one of all was dance...and music. I like both of them. And art too, Art was the best too," he said. Themistocle performed, had artwork on display and joined The Reminders onstage to sing the chorus of their song "No Matter." "I like that song because to me it means like if you're being bullied you still gotta keep going on in life. Because haters will always come for you and drag you down and stop you from becoming who you want to be in life," said Themistocle. He said he would like to participate in similar programs in the future. Garcia said MDC Live Arts plans on returning to Opa-locka for future projects. You can find information on upcoming Live Arts events here. 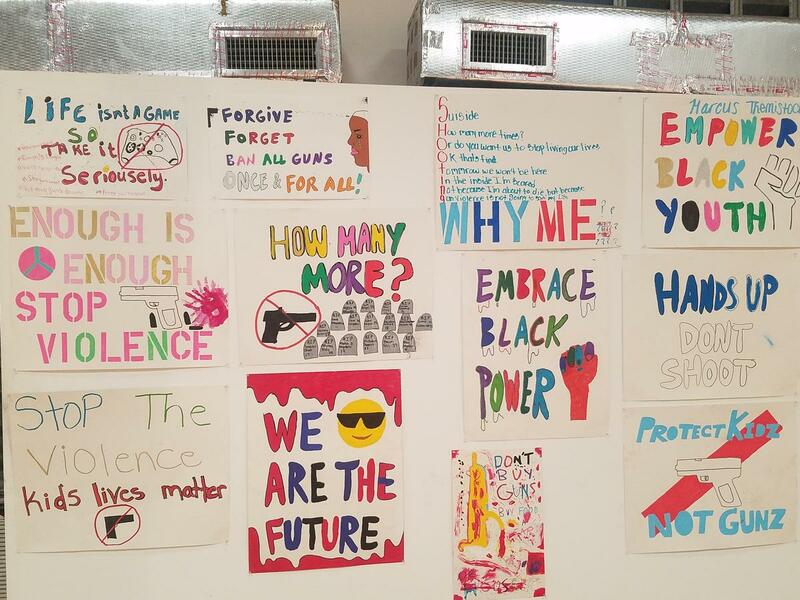 Signs created by students who participated in the walkout for the 19th anniversary of the Columbine High School shooting on display during the Hip Hoppa Locka Block party.